Give up? Up until fairly recently, it was illegal to put a GPS on your windshield in those states. Imagine buying a new GPS with the suction mount and getting pulled over a few days later for using the mount in the box. We got all kinds of stories from people after their wallet was $100 lighter and sold a lot of vent, cup holder and dash mounts as a result. Fortunately, these two holdouts have now joined the rest of the country in permitting attachment of GPS units to your windshield. (b) This section does not apply to any of the following. 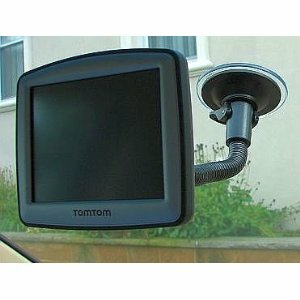 12) A portable Global Positioning System (GPS), which may be mounted in a seven-inch square in the lower corner of the windshield farthest removed from the driver or in a five-inch square in the lower corner of the windshield nearest to the driver and outside of an airbag deployment zone, if the system is used only for door-to-door navigation while the motor vehicle is being operated. While I’m no lawyer, it sounds like you are restricted to attaching your GPS to the left hand corner of your windshield. That’s not too convenient. I don’t know about you but I like mine right smack in the middle of the windshield. The California law is pretty detailed and I can’t quite figure out their reasoning. I suppose the GPS, especially larger ones, can partially obscure your view if placed in the middle of the windshield. I never had an issue with it. I also suppose that it can get in the way of an airbag deployment but that depends upon a lot of factors, primarily the location of your airbags. By the way, just for the record, California is OK if you attach a toll tag such as EZPass to your windshield. Minnesota joins California on allowing toll devices on the windshield too. Be cognizant that it’s not entirely clear what these states consider a GPS. If you attach a phone or tablet with a GPS app, these exceptions might not apply. Ah, it sure is nice to be able to stick your GPS wherever you like in the great state of New Jersey!